As commuters fume in traffic or whiz through neighborhoods they’d never want to visit, Tom Alexander walks the streets of Bakersfield, five days a week, three hours a day, towing a large wooden cross. If you’ve passed by him in your car or seen him tread by your house, he’s praying for you. Downtown continues to be my favorite destination each Monday morning. There is no greater feeling than hoisting the ten foot by five foot, 60-pound cross upright and praying for Kern County’s judicial system, that God’s justice and righteousness will prevail over Bakersfield. Individuals are now coming up and praying with me for the city of Bakersfield as well. 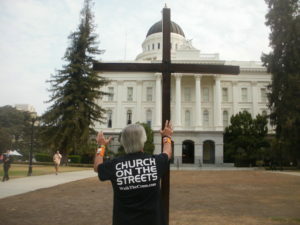 Downtown is also where I hand out more “God’s Plus Sign: The Cross of Jesus” brochures than other places I walk. As I hoist the 60-pound cross upright at the downtown police station and right next to the memorial honoring fallen officers, my prayer is the very same one etched on the bronze memorial: Psalm 23. Praying for the safety of Bakersfield’s finest and their families is one of my favorite times during Crosswalk Bakersfield. Didn’t know Oswell was such a hilly street until I cross-walked it. Quite a physical workout for a 58-year old carrying a 60-pound cross downhill and uphill, but I made the 10-mile round-trip journey. I am surprised at how many people waved or blow their car horns as they pass by – by far more than any other street I’ve walked so far. As I cross one of the side streets a young man jumps out of his truck and says, “I drove past you on the other side of the street but I had to turn around and come shake your hand for what you’re doing.” He explained that he had just became a Christian and the sight of the large cross filled his spirit with joy and peace that he had to let me know this. A truck approaches rather quickly and comes to a quick stop. “Why are you carrying that cross?” the male driver asks. I tell him why and he nods his head in agreement. “You know, God healed me a few months ago of congestive heart failure. I should be dead, but He brought me back to life.” He paused for a long moment. “I should be doing what you’re doing. I’ve got so much to thank God for. I saw you carrying the cross from across the street and I had to turn around and find out why you were carrying it. What you’re doing is a great testimony for the Lord.” We had a pleasant conversation about God’s love and power. With a “God bless you!” he waves good-bye and takes off, a smile across his face you can see a mile away.